Summertime is a GREAT time to be a car dealer! The market is flooded with Active Shoppers, and it’s high time for selling cars! But there’s a catch. Just because the market is bustling, it doesn’t mean that you’re getting all the juice from the fruit. Here’s the hard truth: if you’re doing the same things everyone else is doing, then you’re going to get the same results everyone is getting—no less, but also NO MORE. And that means that you are leaving valuable opportunity on the table. Status quo thinking and common sense action deliver status quo results. So if you are seeking more than average results and success you need to do something different! We’ve heard some crazy stories about how dealerships should determine their advertising budgets, but we’ve nailed down a more effective way to do it that’s just as easy (maybe even easier) and ensures explosive growth. Probably the most common way to come up with an advertising budget in the automotive industry is to look at your gross sales from last month, take 12.5% of that number and allocate it to advertising. Lots of dealerships do it this way! And this approach might work for you, if you’re not looking to grow. But if you want to sell more, faster and experience explosive growth, then you need a fast growth model for determining your ad budget that will bring in a ton of additional traffic. The formula we use for this is so simple it’s crazy. Take your average advertising cost per car and multiply it by the number of cars you WANT to sell. Now this is the key. If you want to grow, you can’t determine your budget by looking BACK at what you did last month. You have to look FORWARD, toward your goals. In terms of that CPC number, it can vary a bit from market to market. So the key is to find your average and multiply that by the number you WANT to sell—that should be your budget. The hard truth is that you’re never going to sell more cars by spending less money. And yet so many dealers who are looking to grow, shoot themselves in the foot by cutting the one area of budget that will get them the additional traffic they need to sell more cars. Simultaneously, some dealers think that since the market is having a heyday, now is a good time to rollback their marketing budgets—save a little coin, if you will, to user later when times are tougher. But just because there are typically more Active Shoppers in the market does not make this a good idea. Here’s the deal: if you cut back your advertising budget, your sales numbers are going to fall. A lower ad budget equals fewer leads, which equals fewer sales. Period. For instance, one of the dealers we work closely with came to us last year to tell us that they were seeing a decrease in sales. And in fact they had, they’re sales had fallen off 11% over the course of 6 months. But we knew that their marketing hadn’t changed, so what could be responsible for this dip? We’re curious guys, so we started looking into it. Turns out that over that same 6-month period, remained relatively the same, but they had reduced their advertising budget by 11%. Ah-ha! Less money spent equals fewer cars sold. And it’s pretty linear as you can see. You see, your advertising budget and marketing is the fuel that powers the whole machine—traffic, leads and sales. So if you’re looking to grow, you should never cut. If you roll back your ad budget and you don’t see this kind of impact, then you need to start asking how effective that marketing was in the first place. Your ad dollars should directly correlate to your sales numbers if your advertising is working, which brings us to STEP 2. STEP 2: Investigate how are you spending those ad dollars. The biggest mistake dealerships make when it comes to advertising is that they spread their ad budget around numerous media options. They think that this means they are covering all the bases, so they do a little here and a little there, then cross their fingers that something works. We call this approach SPRAY and PRAY because you SPRAY your budget all over the place and then PRAY something sticks, and it has actually become the de facto standard for media budget allocation over the years. But it doesn’t work! The reason it doesn’t work is that each media option gets so little of your ad budget that it doesn’t make an impact. A low-frequency presence is the same thing as no presence at all. It simply can’t break through the static, the clutter of advertising methods that confront consumers each day. The trick to breaking through this static and driving a tremendous amount of traffic to your doorstep is to dominate a single media first, before moving on to a second or third media. to reach a certain threshold or critical mass before they start to be really effective. Most local advertising absolutely fails to ever reach this threshold, so it absolutely fails to be effective. Also present in every media is a sweet spot— where the return on investment is at its highest—and a point of diminishing marginal returns—where the return on investment starts to drop. The goal should be to determine the sweet spot in any media and invest up to, but not beyond, that point in order to maximize the traffic that results from that advertising—before adding any other media. Step 3: Take a long, hard look at your marketing. That’s right, you will end up with more customers and a much higher profit than if you follow the traditional Same Is Lame® automotive marketing model. 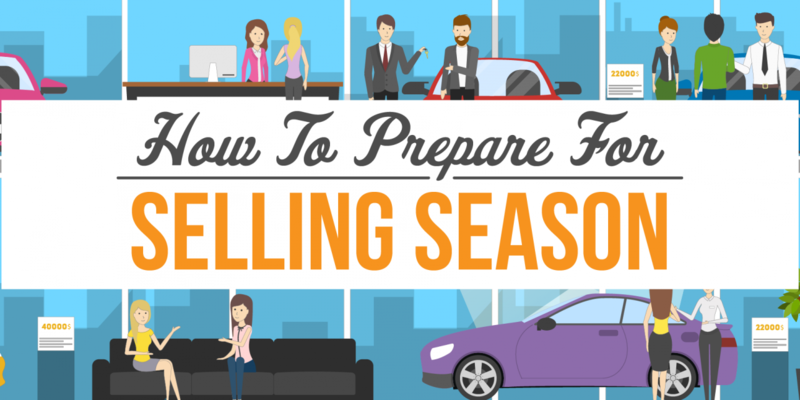 Finally, And Potentially Most Importantly, If You Want To Take Full Advantage Of The Selling Season, You Need To Quit The Car Business! This is the key to success whether the market is buzzing or plunging. Imagine knowing you’re taking full advantage of the market; you’re making hay while the sun is shining, and you KNOW that when the market goes the other way, you’ll still be safe.